While perusing the news from Northwest China in mid-April 2017, I came across a story about a Uyghur official who refused to smoke cigarettes in front of other devout Uyghurs. The Communist Party leader was publicly shamed and demoted for his failure to remain resolute in his “commitment to secularization.” Smoking, the state declared, was a personal choice that must be protected. By this logic, an individual’s right to smoke is thus a fundamental form of freedom: freedom to consume the secular. Smoking, like secularism, is a manifestation of the norms of Chinese citizenship. Prohibiting it is symptomatic of a social malady. The story, published by the Associated Press on April 11, 2017, reminded me of my own experiences of smoking with Uyghur friends. It reminded me of a time when I was smoking cigarettes with a Uyghur friend as we wandered the back streets of Kashgar. We were on the prowl for late-night bowls of hand-pulled noodles or laghman. As we walked down an alleyway leading up to the restaurant we happened across a neighborhood mosque. My friend whispered to me that we should turn our cigarettes away from the mosque, shielding the mosque from them with the back of our hands. Our palms cupped upward, the lit end facing away, we walked by the front of the mosque and continued on our way. “It’s a sign of respect to do this,” my friend said. As I read through the story of the Uyghur official refusing to smoke in front of older men from his community, this memory came back to me. Here it seems as though we have indigenous, Islamic norms of respect and moral values being pitted against secularism and socially-mandated individual choice. A common sense form of Uyghur morality is now being read as a kind of religious extremism. If you don’t smoke in front of those you respect, the state is saying it is fair to assume you are one of “those who wear the short pants” (kalte ishtanchi); or what Uyghur villagers often refer to as “wahabi.” That is, you are someone who has been influenced by the orthopraxis of reformist Islam and now wears pants that end above your ankles in the manner of the devout. If you don’t smoke in front of your elders, you must be someone who has been influenced by the teachings of the Tabligh Jama’at, the Islamic Movement of Uzbekistan, Turkey-based Uyghur Salafimovements, or, from the state’s perspective, teachings that are even darker and more nefarious. Reading the story of the shamed Uyghur official I was struck by something that the scholar Adrian Zenz said in the Associated Press version of the story. He said that what the state is attempting to do in Northwest China is “re-engineer” Uyghur society by removing any trace of Islamic influence. The type of human engineering he was referring to is, of course, a modernist, secular project. As Ann Anagnost puts it in the introduction to her co-edited volume Global Futures in East Asia, human engineering refers to “projects to create new kinds of subjects for political and economic transformation” (8). Often these sorts of projects are pitched as a kind of “progress,” as an emancipation of individuals from the hierarchical rule of the past. Often the goals of these projects shift over time, which is what makes the current situation in Northwest China one of “re-engineering” as Zenz correctly notes. Initially the “liberation” of the Uyghurs by the Chinese state, was one that intended to foster class struggle among indigenous religious minorities and, through this, call into existence a form of socialist equality and an erasure of historical differences. With the failure of the Chinese communist engineering project in the 1980s and the turn instead toward state-directed capitalism the project shifted. Now the promise of human engineering rests in the immersion of indigenous religious minorities in secular education systems. This secularization holds out the promise of sophisticated cultural and economic achievement through science, rationality and entrepreneurship. It also turns on the education of the consumer and the protection of the free flow of goods. These are the reasons why the consumption of cigarettes can become a locus of moral concern. By not smoking a Chinese state-produced cigarette in front of devout Uyghurs, the official was positioning himself in opposition to the engineering of the state. Of course, for many members of an indigenous minority such an engineering project often feels much like a process of social elimination, in this case the elimination of Uyghur Islamic knowledge, history and religious institutions. As in other settler-colonial contexts (see Patrick Wolfe 2006), being forced to speak the language of the colonizer, prohibited from performing religious practice and compelled to perform secular rituals imposed by the colonizer functions as a form of epistemic violence and structural oppression rather than a liberation of indigenous minds. By describing the forced smoking story as symptomatic of a re-engineering project, Zenz is pointing us toward the continuities between the current secularization project and the projects that were put in motion in 1949 that culminated in Mao Zedong’s Cultural Revolution in 1966. During that time hundreds of mosques were demolished, Uyghur mollas were disgraced and imprisoned. It was also around this same time that Uyghur farmers were mobilized as propagandists. As in other locations across the nation Uyghurs were tasked with producing an authoritative visual language while maintaining their status as productive members of society. In their leisure time at the end of the day, in county level art centers, they were taught to paint murals, posters and banners. The works of visual art they produced demonstrated their ability to act as ideological agents in mobilizing farmers in revolutionary socialist struggle. It projected the role they played in the proletarianization of urban elites (see the above image). Of course this art production was under tight party control, the national level cultural ministry dictated the parameters of what was to be produced to provincial level organs who in turn did the same at the level of the prefecture on down to the county. This is how art styles that focused on re-engineering the lives of Uyghur farmers first arrived in rural Xinjiang. As the Uyghur author Qıyum Bawudun (1997) has noted, beginning in the Cultural Revolution this new aesthetic style began to focus on the construction of a “moral” civilization that placed a priority on socialist-materialist ideology. From the very beginning then, Uyghur farmer propaganda, painted by untrained rural Uyghurs for other rural Uyghurs, was focused on moral edification. It is easy to dismiss propaganda as simply a tool of the state for engineering the disciplined subjects it desires. But it is more than this. Propaganda can produce a style of seeing and acting in the world. Although the social reforms of the 1980s introduced new forms of commerce, much of the socialist cultural industry continued on, particularly in Northwest China. In the decades after the death of Mao in 1979, the socialist cultural industry became a way for Uyghur farmer painters to achieve province and country-wide recognition in propaganda painting contests. Villages and counties competed against each other to see who can produce the most and the best forms of propaganda. Not only did this production promote the ideological agenda set in Beijing, it also became a tool of distinguishing the cultural acumen of local communities. As the successive waves of “hard strike campaigns” were put in motion in the 1990s to root out ethnic separatism, religious extremism and, after September 11, 2001, terrorism, Uyghur cultural production units were given even more incentives to continue to produce paintings and murals. This is why, even today, local propaganda production reaches the most basic levels of social life in Southern Xinjiang. Small children to elderly farmers who have never learned to speak Chinese understand what is being communicated in the paintings and murals. It is how the state communicates the vision of its project, how people communicate their own positions within the engineering project and one of the ways people learn how to perform within the limits of what is permitted. An award-winning Uyghur farmer painting that responds to the Chinese President Xi Jinping’s 2014 call for the Uyghur masses to slaughter Uyghurs suspected of terrorism like vermin. The most recent turn in this visual language, toward the support of the “People’s War on Terror” which was announced in by President Xi Jinping in 2014, has it’s own style as well. Much of it borrows from the counter-revolutionary imagery of the Maoist past. The representation, for example, of suspected terrorists as humans-becoming-vermin (pictured above) recalls the representations of counterrevolutionaries during the Maoist period. Because the new propaganda is now explicitly aimed at an Islamic target, there is also a “secularization” ethos to the new murals. In these paintings the exchange of certain commodities are protected while others are prohibited. Yet despite these variations in the engineering project, capitalist secularism instead of Maoist socialism, much remains the same. As was the case during the Cultural Revolution, in our current moment thousands of mosques are being destroyed, Islamic teachers or mollas and their followers or talip are being imprisoned and placed in indefinite detention in political reeducation labor camps. Of course the rise of transnational communications that has accompanied the secular, colonization of the Uyghur homeland has also given rise to increased reception of global Islamic movements, and this, more than an intensification of indigenous Islamic traditions, is what is driving the Uyghur turn toward reformist Islam. In what follows I will present a series of images of murals produced after the beginning of the “People’s War on Terror” by a single propaganda team of Uyghur artists in a village named Seghin Soget near the oasis town of Kucha. Seghin Soget is known throughout the Kucha region as a center of religious life. There is even a popular saying among local Uyghurs that states that “the (religious) stability (muqimliq) of Southern Xinjiang lies in Kucha, the stability of Kucha lies in Seghin Soget.” As one Uyghur woman from the Kucha area told me, “They are true believers in Seghin Soget.” Viewing the current propaganda from Seghin Soget might thus be seen as symptomatic of how the most devout are being reimagined by the state. Along with the images I will provide an analysis of the themes and styles that emerge from them, followed by some concluding remarks. The re-engineering of Uyghur lives begins in the home. One of the primary objectives of the state development campaigns in the late 1990s was bringing state television into the homes of every Uyghur. In many locations televisions were provided free of charge. Not only was this a way of communicating state goals, achievements and criticism with a mass audience, it was also a way of introducing commercial advertising centered around urban development and cultural sophistication. Television programing also allowed the state to control the dominant representation of Uyghur ethnicity through Uyghur language operas, talk shows, dramas and comedies. With the arrival of 3-G networks in 2010 many young Uyghurs began to circumvent this centralized form of mass communication by instead relying on their smart phones for news and entertainment. 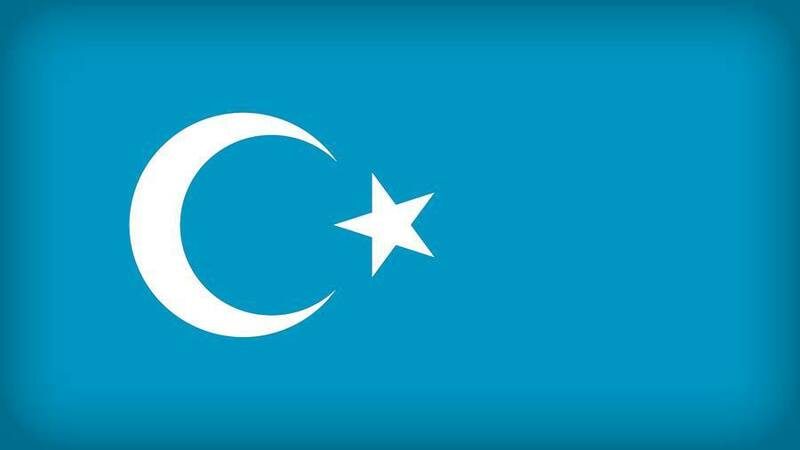 As new Islamic teachings began to circulate on these same networks many Uyghurs began to see state television as harmful. Since it was directed against Islamic orthopraxy, and increasingly centered around patriotic programming, many devote Uyghurs began to abstain from watching it. Now, as this image indicates, people are being pressured to begin watching state media again. In some cases, certain propaganda programs such as the mini-series Anarxan, which presents Uyghur traditions as oppressive and in need of Chinese liberation, have become mandatory viewing. Engineering Uyghur minds continues outside of the home in the domain of education as well. For decades it has been illegal for Uyghur youth under the age of 18 to study religion. Teaching one’s children how to pray or encouraging them to fast during Ramadan has come to be considered a form of religious extremism. In fact, the education system has been set up in direct opposition to religious education. As has been widely reported, during Ramadan Uyghur children are forced to eat and drink at school; they are often held at school during prayer times so that they cannot pray on their own. Of course, prior to the start of the “People’s War on Terror” in 2014, many parents sent their children to neighborhood teachers for an informal education in Islam. Now, basic knowledge of Arabic, is considered a sign of religious extremism. Children are frequently questioned by their teachers regarding their knowledge of Islam and their parents’ religious practice. Recently there have been reports of children being taken from parents suspected of religious extremism. This component of the reengineering project is called a rectification of Islam. As in the smoking story that I used to introduce this essay, refusing to consume haram products is now also considered a political act. Since 2009, around the time the most recent turn to reformist Islam began, Uyghur men across Southern Xinjiang have stopped drinking in public. Many of them refuse to drink in private as well. This stands in marked contrast to the widespread alcohol consumption that existed prior to the most recent secularization project. In fact, up until 2009 anti-alcoholism was one of the main features of Uyghur-language state television programing and propaganda work prior to this turn toward abstinence. Now, with the implementation the “People’s War on Terror,” the state is taking a stand in support of free circulation of haram products as approved commodities, even while in other parts of China there are active campaigns against excessive alcohol consumption and smoking in public. The anthropologist Louisa Schein (2000) has described the Chinese form of multiculturalism as one of “permitted differences.” This politics of recognition is premised on the role of the state in dictating the terms of religious and cultural expression. Indigeneity is thus subject to the sovereignty of the state; permitted differences are “a gift” allowed by the state. Any attempt to deviate from this gift of permitted difference is seen as a challenge to the state and thus a manifestation of what the state refers to as the “three evil forces”: separatism, extremism or terrorism. Since 2014 the enforcement of permitted differences has become a part of daily life. It now invades the most intimate aspects of Uyghur sociality. The engineering of difference begins with engineering the appearance of the body. Uyghur women and men are now tasked with grooming and clothing themselves in such a way that they perform their identity properly. During the “People’s War on Terror” this means that Uyghurs are tasked with wearing doppa, the traditional prayer hat, that has come to mark their ethnic difference. Uyghur women are told to wear dresses made of etles, the colorful silk fabric we see represented in these murals, or mass-produced Western-style clothes made in Chinese factories. They are told that their dresses cannot extend past the knee. Dressing in accordance with Islamic moral convictions that deviate from this standard is not permitted. Not sharing food with those who practice their faith differently is also prohibited. The engineering of proper ethnic difference is also related to the comportment of the body and the regulation of intimacies between people. Since 2009, Uyghur marriage ceremonies have become a major source of contention. Around that time, the focus of marriage ceremonies as festive celebrations, on eating, drinking and dancing, began to shift to that of moral instruction. Since mosques are tightly regulated by the state, people began to use the ceremony of the marriage in courtyards of the home as a space in which to invite molla to offer teachings in Islamic orthopraxy. One of the outcomes of this shift in focus was a new reluctance to turn Islamic marriage ceremonies into festive occasions. Just as Uyghurs began to stop drinking, pious Uyghurs also began to stop dancing. In 2014 the state began to intervene in these ceremonies, demanding that weddings include music and dancing. If state representatives did not observe dancing at the wedding the new couple faced having to pay a fine of over 3000 yuan. Islamic divorce procedures were also outlawed in order to prevent pious men from divorcing wives who did not meet their standards of piety. Of course the hand of the state goes far beyond marriage. It also regulates Islamic gatherings in general, preventing all forms of unapproved Islamic teaching. The indigenous practice of oral storytelling, of gathering to practice ecstatic Sufi traditions and epic performances of the history of Uyghur Islam are thus being eliminated. Or, perhaps worse, they are being appropriated for forced wedding celebrations and patriotic “healthy” dance parties, or saghlam meshrep, that have now become an obligation for Uyghur farmers across Southern Xinjiang. This of course has the effect of alienating Uyghurs from their own indigenous practices and knowledge traditions; traditional meshrep activities that centered on moral instruction have been labeled “unhealthy,” or saghlam emes. What might look like a simple gathering of neighbors is now a tense situation that is closely monitored by local officials. Even in death there is no escaping these deep tensions. Now a lack of audible mourning at funerals is now seen as a challenge to the parameters of acceptable difference. Funerals are seen as extremist if the relatives of the dead do not mourn loudly; yet, at the same time it is now illegal to hire Sufi mystics to perform the mourning ceremony as many Uyghurs have done in the past. Another dominant theme that emerges from viewing contemporary Uyghur propaganda is the sheer force of the state. These images tell a story of surveillance and merciless force. Uyghurs who follow Salafi teachings are represented as dark, shadowy figures caught in the net of the machine of the state. The state in these images is a deep state with spies everywhere and technology that can observe every download every transaction. The message of this story is that the state is powerful. It has guns, police, ships and planes and seals, courts, laws and prisons. There is no escaping the sovereignty of the state. It is futile to resist its moral instruction. The “three forces” that are continually referenced in these images of state force are shorthand for the “three evil forces” that the Chinese state has identified as the source of resistance to their re-engineering project. The three forces are ethnic separatism, religious extremism, and violent terrorism. In the Uyghur these forces are often referred to as “elements,” or unsurlar, a term that immediately recalls the counterrevolutionary rhetoric used in the Cultural Revolution to impugn all “black elements” that resisted the dominance of communist engineering. By regulating the bodies and homes of Uyghur Muslims the Chinese state is attempting to assert its will in every aspect of Uyghur life. From raising children, to marriage and death the state is there to regulate Uyghur morality. It is there to dictate who you meet with, whose food you eat, what you drink, how you dress and whether or not you dance. The state is there to make sure you sleep only in approved locations. It is there to invade your home and make sure you have only approved literature, that your smart phone is “clean,” that there is not a surplus number of slippers by the door to your home. The state is there to tell you what is reactionary and what is secular; what is extreme and what is a permitted tradition. The goal across this visual imposition is to transform the minds of viewers. By both demonstrating the promise of secular achievement and the force of Chinese control these images create an atmosphere of inevitability. Uyghur farmers seem to have no choice but to accept secularization and the elimination of unpermitted Islamic practices. The state photographer Zheng Yanjing who took the images of these Uyghur propaganda murals lauded them as an example of the way “masses” of farmers in Southern Xinjiang have come to understand “the dangers of religion” (Zheng 2016). To his thinking, they are examples of how Uyghur farmers are engaged in a struggle for secularism against the tyranny of religious dogmatism. Of course, this is not the way the many Uyghurs I have spoken with about these murals feel. To their thinking, they are examples of the imposition of the state in their lives. These are images that make them deeply anxious because they demonstrate that in the eyes of the state all of them are extremists until proven otherwise. Unless they dance at weddings and refuse to practice their faith according to their convictions, they are suspect. By the logic of this images, the way my friend and I turned our cigarettes away from the mosque as we walked by was a sign of our religious extremism. The way we raised our hands and offered a prayer after a meal, the way we greeted each other with the Arabic greeting “assalam alaykum” was a sign of our lack of secularism. Every action in public and in private is coded in these ways. It is impossible to know who to trust. No one knows who will be arrested tomorrow and forced to inform on his friends and family. There is no recourse to justice. Guilt is easy to assign and impossible to escape. There are often ways to resist human engineering projects. In small-scale communities, something Nancy Fraser (1990) calls counter-publics, people can often find solidarities in resisting ideological imposition. But in Northwest China the current engineering project seems so totalizing, so extreme, that it is becoming increasingly difficult to imagine a way out. It is becoming difficult to think beyond the state’s imagination of Uyghur Muslims. All of these images were taken by the Xinjiang-based photographer and journalist Zheng Yanjiang for the state news organization Tian Shan Network. They are reproduced here with the stated permission of the photographer. Anagnost, Ann, Andrea Arai, and Hai Ren (Eds). (2013). Global Futures in East Asia: Youth, Nation, and the New Economy in Uncertain Times. Palo Alto, CA: Stanford University Press. Associated Press. (2017). “China punishes official for not daring to smoke near Muslims.” Published April 11. Viewed on April 14, 2017 at http://www.nydailynews.com/newswires/news/national/china-punishes-official-not-daring-smoke-muslims-article-1.3042090. Bawudun, Qıyum. (1996). Mekit Dıhqanlar Resimler Toplimi (A Collection of Peasant Paintings from Mekit County). Ürümchi: Xinjiang Fine Arts and Photography Press. Fraser, Nancy. (1990). “Rethinking the Public Sphere: A Contribution to the Critique of Actually Existing Democracy.” Social Text, (25/26), 56-80. Qeshqer Edibiyat-Senıti. (1975). “Makit Dihanliri Rasimleridin” (Paintings from the Farmers of Mekit County). Kashgar Literary-Arts, 5, 79-82. Schein, Louisa. (2000). Minority Rules: The Miao and the Feminine in China’s Cultural Politics. Durham: Duke University Press. Wolfe, Patrick. (2006). “Settler Colonialism and the Elimination of the Native.” Journal of Genocide Research, 8(4), 387-409. ZHENG Yanjing, (2014). “库车色根苏盖特村农民画笔下的‘去极端化’”(‘Extremism’ as Painted by the Farmers of Kucha, Seghin Soget Village). Tian Shan Wang. Viewed on April 14, 2017 at http://chuansong.me/n/860797252860.